An outpouring of support for Penny the cat, the unofficial mascot of the Swansea Public Library, has led a Massachusetts man to give up his efforts to evict the cat from the public building . Patrick Higgins sent an email to Swansea Public Library trustees last Saturday, which said he would file a formal complaint with the U.S. Department of Justice if Penny was not removed from the premises. According to Higgins, people allergic to cats would be unable to use the library which meant the public building did not comply with the American Disabilities Act. As news of Penny's potential eviction spread, supporters for the neighborhood cat began to rally creating petitions to keep the Penny on the premises. One petition on Change.org has elicited nearly 1,800 signatures. Yesterday Higgins sent out a release saying he would not file a formal complaint as long as the library posted warnings that there was a cat on the premises, the local board of health certified there were no possible health issues related to Penny's presence and that after her death no cat would replace her. Reached for comment Higgins said he was surprised that his email had gone viral. "The cat has gone all over the world. You've got the petition with over 2,000 people over a freaking cat," Higgins told ABCNews.com. Higgins said he was spurred to send the letter, which also mentioned other building issues, after speaking with people who told him their children didn't want to go to the library because they were allergic to cats. "We've got pictures of the cat on Facebook laying on top of a laptop and they think this is ok. I just don't understand it," said Higgins. Brian Lowney, chairman for the library board, said that he had never seen a complaint similar to this but that Higgins' concerns would be addressed in a trustee meeting later this week. "As library trustees we have the responsibility to serve all of the constituents in town," said Lowney. "We are working very diligently to resolve this issue." 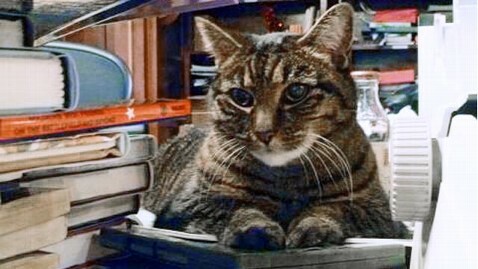 The Swansea Public Library has been home to at least three resident cats starting in 1986. A cat adorns the library's sign in front of the building. Dena Iverson, spokesperson for the U.S. department of Justice, said even if Higgins had filed a complaint it's not clear that the Swansea Public Library would have had to give up Penny. "The ADA does not prohibit animals from public buildings," Iverson told ABCNews.com. "Allergies are covered by the ADA if they are severe enough to substantially limit a major life activity." The library could also make "reasonable modifications" to address these allergies including adding an air filter. One side-effect of the public outpouring of support is that there has been an uptick in people registering for library cards, according to Lowney. He said even Penny got her very own card.